Goddess who in the Ennead of Heliopolis is the daughter of Geb and Nut, according to the calendars born on the fourth epagomenal day. She was the wife and sister of Osiris and the mother of his son Horus. In the traditional version of the Osiris myth, Isis is the one who searched for her husband's body after his death. Once she had found all the pieces scattered by Seth throughout Egypt, she assembled them into the first mummy, which she then reanimated with the breath of life from her wings and by whom she conceived Horus. Together with her sister Nephthys, Isis first appeared as a wailing woman around the body of the deceased Osiris; their sorrow changed into celebration when Osiris was (temporarily) reanimated. In the marshes of the Delta, near Chemmis, she hid her son Harsiese ('Horus, the son of Isis'). Although the child was safe from Seth here, he was threatened by other dangers, such as scorpions, snakes and crocodiles. One of Isis's most important duties was to protect the child against these dangers and to heal any bites or stings. In the texts on a number of magical stelae, first found at the end of the New Kingdom but mainly dating from the Late Period, Isis as 'Great of Magic' is called upon to provide protection and healing. Later, once Horus had grown up and become Harendotes ('Horus, protector of his father'), Isis helped him in his struggle against Seth, although there are also references to antagonistic contacts with Horus who beheaded her, while she cut off his hands. From at least the New Kingdom, Isis was frequently associated with the goddess Hathor (whose name means 'House of Horus', perhaps an indication that she was the original mother of Horus) from whom she acquired her headdress, cow's horns and sun disk. As a cow goddess she could also be worshipped as the mother of the Apis bull. Isis was not only identified with Hathor but also with many other goddesses, such as the goddess of the west, Imentet, the uraeus as the Eye of Re, Nekhbet and Wadjet, Sakhmet and Bastet, and also with Mut the wife of Amun. Isis was worshipped in a great many temples, the most important of which were in Coptos (called the Upper Egyptian Iseum in the Late Period), Nubia (among other places, Buhen), and Philae. Because of her link with Hathor, the goddess also played an important role in Dendera. The popularity of the goddess is demonstrated by the fact that her cult survived in Philae until the 6th Century AD, and was only ended by a decree by Justinian in about AD 537. In the Hellenistic world, the cult of Isis spread throughout the entire Roman Empire. Various temples for the goddess were built in Rome. The goddess's name possibly means 'seat' or 'throne', although this is still controversial. What is certain is that she was linked with the royal throne which is represented by the hieroglyph that is often depicted on her head. 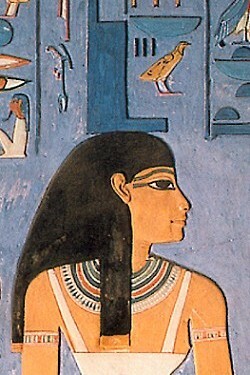 Isis was also considered to be the symbolic mother of the living king, who was the personification of Horus. Isis is usually depicted as a woman with the symbol of a throne on her head or else cow's horns and a sun disk. Sometimes she is shown with wings attached to her arms or as a bird, referring both to the myth of Osiris where he received shade and the breath of life from her wings and also to the wailing women who, just like certain birds of prey, emit shrill sounds of mourning at the death of Osiris. Isis is also known in the form of a cow. Many statuettes from the Late Period, often of bronze, show Isis suckling her son Horus on her lap.